Posing on the Swilcan Bridge on the Old Course in St. Andrews. Let's face it: this post is for my family. You other folks are free to peruse it, but prepare for an onslaught of pictures of my 'rents. Last week, Nana and Grampa Bill departed for the States after a three week visit. Although we spent some time in Glasgow, most of their visit involved daytripping and overnight stays. They touristed in Edinburgh, Scone, Glamis, Paris, York, and St. Andrews, among other towns. We were with them for all but York, which they did on their own (and Kate, Jackson, and I visited back in March). Play area at the National Museum of Scotland in Edinburgh. Natural history at the museum. Grampa Bill's cake decorated with thistles and Saltires (national flower and flag of Scotland). We toured Scone Palace in Perthshire. We particularly enjoyed the grounds of Scone Palace, including the hedge maze. They've left me behind in the maze! Outside the magnificent Glamis Castle in Angus, Scotland. It was the childhood home of the late Queen Mother. Unwinding in our rental apartment in Paris. A beautiful afternoon to visit the Eiffel Tower. Try as you might, you can't force a toddler to smile for the camera. Notre Dame in the background. Gotta find playgrounds to burn off energy. I quite like this picture of Grampa Bill. Enjoying a cruise on the Seine. Lunch outdoors at a cafe. Shakespeare and Company is a century-old, idiosyncratic, English-language bookstore. Outside the gates at Versailles. In front of the palace. Nana and Kate selfie in the apartment. Checking emails with Grampa Bill. Street art near the Pompidou Center. 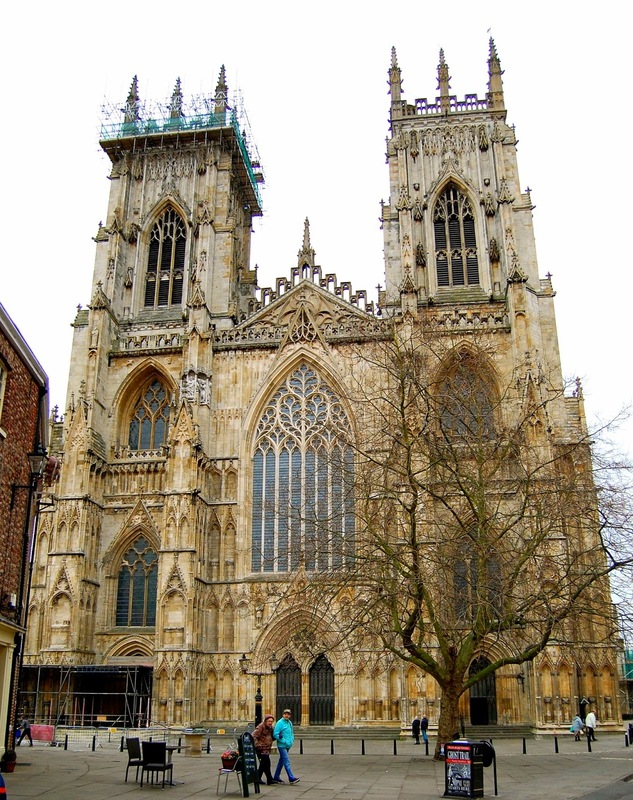 Nana and Grampa Bill traveled to York by themselves, but they toured things like the York Minster. And the National Railway Museum. 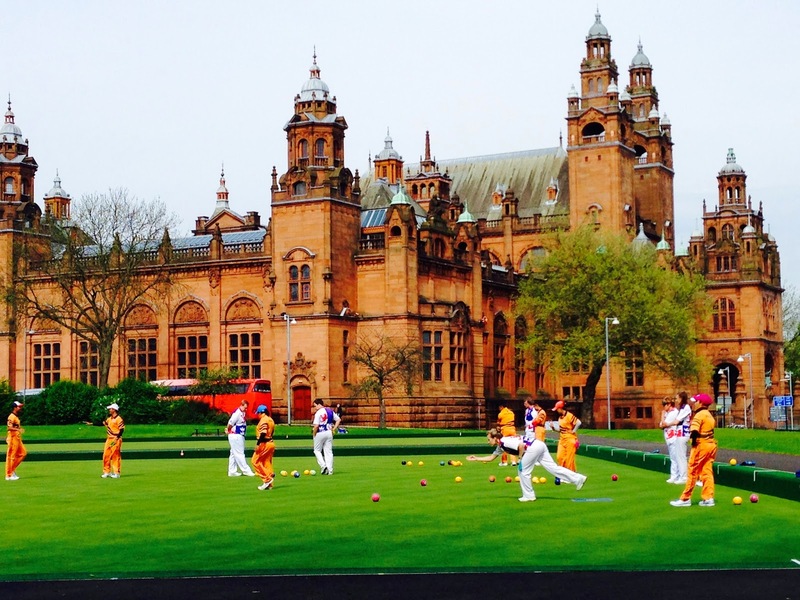 Back in Glasgow, we visited the Kelvingrove Museum and watched a bit of international lawn bowling (Malaysia vs. Scotland). They also helped Jackson as he learns to ride his balance bike -- but he prefers to be held and pushed, thank you very much. Our last trip during their visit was to St. Andrews, to see things like these cathedral ruins. The view through a grated window in the tower of St. Rule's church. Grampa Bill exploring the ruins. We enjoyed playing in the sand on the beach. Note the kid in a bathing suit, while the adults wear pants and coats. Nana reenacting the slow-motion beach race from Chariots of Fire. She nailed the slow-motion part. We really like St. Salvator's Chapel, completed in 1450. Both times we've visited, we've had the good fortune to stumble upon an organ practice. The chapel's organ is magnificent and perfectly suited for the acoustics. Posing in Sally's Quad in the heart of the University of St. Andrews . We had dinner at a pop-up steak house, open only in the summer on Thursday -- Sunday. Its open-air construction is made from farm crates bolted together. Slow service, but the made to order food was terrific. The communal trestle tables add to the community spirit. Grampa Bill sinks a putt on the Old Course, the birthplace of the modern game of golf. In the background is the Royal and Ancient Golf Club (R&A). Nana holes a long putt while Jackson cheers. The Old Course's "Ladies Putting Green" functions as a 9-hole and 18-hole mini-golf course (the "Himalayas") when not used for competition. On most Sundays, the Old Course is open to the public. You're free to wander, have a picnic, walk your dog, and of course, pose for pictures. Grampa Bill on the 17th green -- the most famous Road Hole in golf. On our way back to Glasgow from St. Andrews, we drove home along the East Neuk coastline and stopped at a couple of fishing villages, such as Anstruther. Back in Glasgow, we played at Kelvingrove Park. All in all, a great trip. We miss them! What to do on their next visit? None of us have visited the more distant islands, such as the Orkneys, Shetlands, or Outer Hebrides. They're high on our our to-do list. And perhaps we can entice them to venture out into Europe, either with us or on their own. Thanks for the visit, Nana and Grampa Bill! Exploring a wynd in St. Andrews. Still holding hands after 46 years of marriage.